How to copy iPad files to PC? FREE download iPad to PC copy software at: Copy iPad to PC . Connect iPad to your PC and your iPad content will be displayed. Open a library/playlist, and check the files you want to export. Click "Export Checked Files to Local Folder" drop-down button, then choose "Export to Local" option, then select the folder for saving the checked files in the dialog that opens to start exporting. Now you can copy iPad videos/music to your PC for backup. Tip: You can also right click the checked files, and choose "Export to Local" option to start exporting the files to the folder you want. More info please visit: Copy iPad to PC. How to backup iPad files to PC? 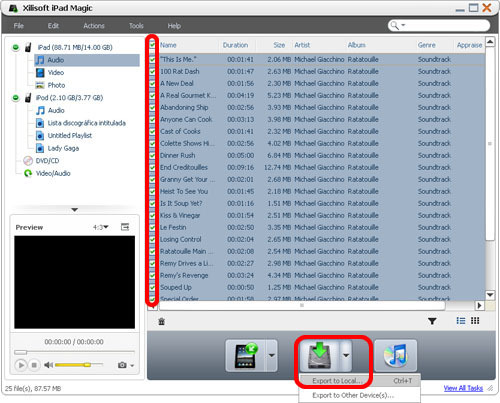 How to convert video & audios to iPad?